According to the American Diabetes Association’s Standards of Medical Care in Diabetes-2011, lowering BP to less than 130/80 mm Hg is the primary goal in the management for most hypertensive patients with diabetes (Table 1). “This cut-off for a diagnosis of hypertension is lower in people with diabetes than in those without diabetes—for whom the recommended BP is 140/90 mm Hg— because of the clear synergistic risks of hypertension and diabetes,” says Dr. Wysham. Randomized clinical trials have demonstrated the benefits of lowering BP, including reductions in CVD events, stroke, and nephropathy. An important caveat, according to Dr. Wysham, is that most patients with hypertension require multi-drug therapy to reach treatment goals, especially patients with diabetes. 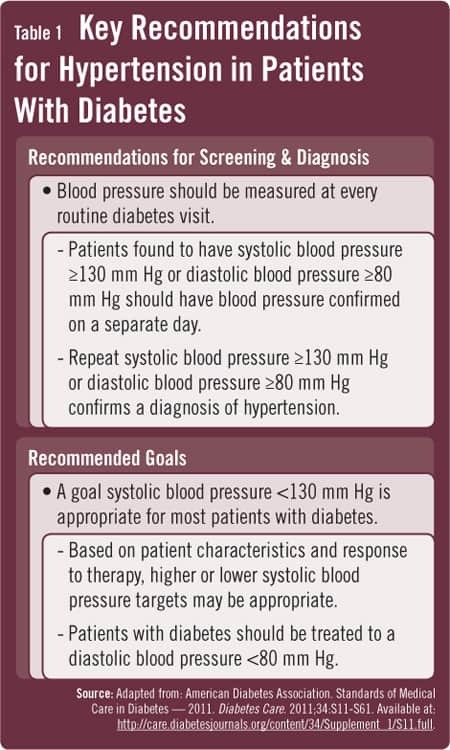 “People with diabetes have lower BP targets, so it’s likely that they’ll require multiple drugs to reach their target BP goals.” If BP is refractory to optimal doses of at least three antihypertensive agents of different classifications (one of which should be a diuretic), clinicians should consider evaluating patients for secondary forms of hypertension or referring them to hypertension specialists. Chobanian AV, Bakris GL, Black HR, et al. National Heart, Lung, and Blood Institute Joint National Committee on Prevention, Detection, Evaluation, and Treatment of High Blood Pressure, National High Blood Pressure Education Program Coordinating Committee. The Seventh Report of the Joint National Committee on Prevention, Detection, Evaluation, and Treatment of High Blood Pressure: the JNC 7 report. JAMA. 2003;289:2560-2572. UKPDS: Tight blood pressure control and risk of macrovascular and microvascular complications in type 2 diabetes: UKPDS 38. UK Prospective Diabetes Study Group. BMJ. 1998;317:703-713. Adler AI, Stratton IM, Neil HA, et al. Association of systolic blood pressure with macrovascular and microvascular complications of type 2 diabetes (UKPDS 36): prospective observational study. BMJ. 2000;321:412-419. Carol H. Wysham, MD, has indicated to Physician’s Weekly that she has served as an advisor or consultant for Amylin and Boehringer Ingelheim. She has also served as a speaker or a member of a speaker’s bureau for Amylin, Eli Lilly, Merck, Novo Nordisk, and sanofi-aventis.